The Body Shop Japanese Cherry Blossom Body Lotion: I love this body lotion from TBS. It has a mild floral scent and is very hydrating. Will post a detailed review on this soon. Plum Grapeseed and Seabuckthorn Mild Foam Scrub: This is not a scrub, rather an exfoliating face wash. It was okay for me. It didn’t dry out my skin. But it contains SLES which I don’t like. 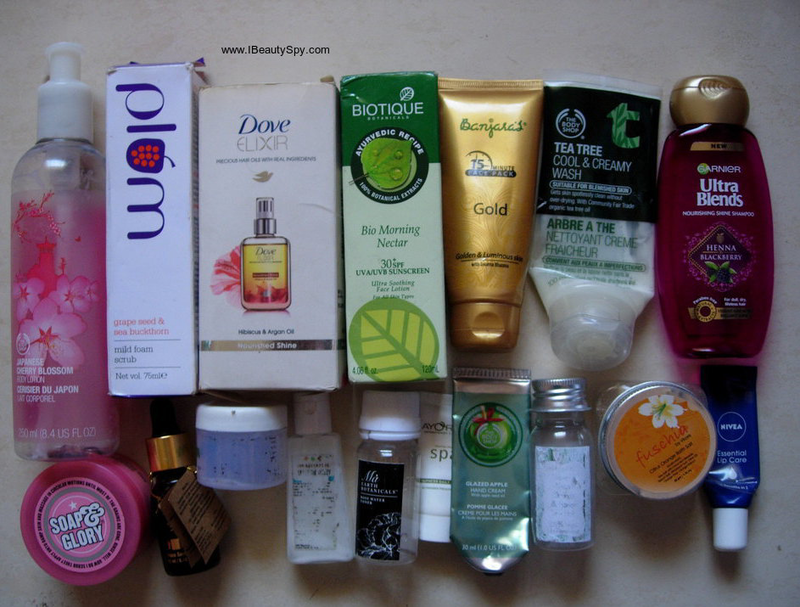 Dove Elixir Hibiscus & Argan Oil Nourished Shine: Am throwing this out as I have got a new hair serum. I have been using it for a very long time over a year and it contains mineral oil which causes hairfall for me. Biotique Bio Morning Nectar SPF 30 Ultra Soothing Face Lotion: I have dry skin and this sunscreen suits me perfectly. It does not leave any whitish cast and blends easily. Banjara’s 15 Minute Gold Face Pack: Love and love and love this. I would definitely recommend all of you to give this face pack a try. It removes tan like a magic and gives a glow which lasts for 3-4 days. The Body Shop Tea Tree Cool & Creamy Face Wash: I have already reviewed this face wash here. Garnier Ultra Blends Henna & Blackberry Nourishing Shine Shampoo: The new range of Garnier is paraben-free and I wanted to try one. This contains SLS but still works well for my hair. Doesn’t dry out my hair and adds shine and lustre. Soap & Glory Flake Away Body Scrub: This is a good scrub which gives smooth and moisturized skin. Will do a detailed review on this soon. Votre Face Serum: This serum worked very well for me. Will do a detailed review soon. The Body Shop Glazed Apple Hand Cream: Didn’t like it much. The scent is very strong and sour that everyone in my office looked up whenever I applied it on my hands. Fuschia Citrus Orange Bath Salt: I loved the sandal bath salt better. This smells like mirinda. An okay kind of product. Nivea Essential Lip Care: I love this lip balm. It is very affordable and moisturizes lip very well making it smooth and soft. It cures chapped lips too. Juicy Chemistry Carrot Skin Rehab Soap: I have already reviewed the soap here. Biotique Bio Saffron Dew Youthful Nourishing Day Cream and Biotique Bio Wheatgerm Youthful Nourishing Night Cream: I have dry, sensitive skin and this combo suited me very well during this monsoon. It made my skin super soft and nourished. 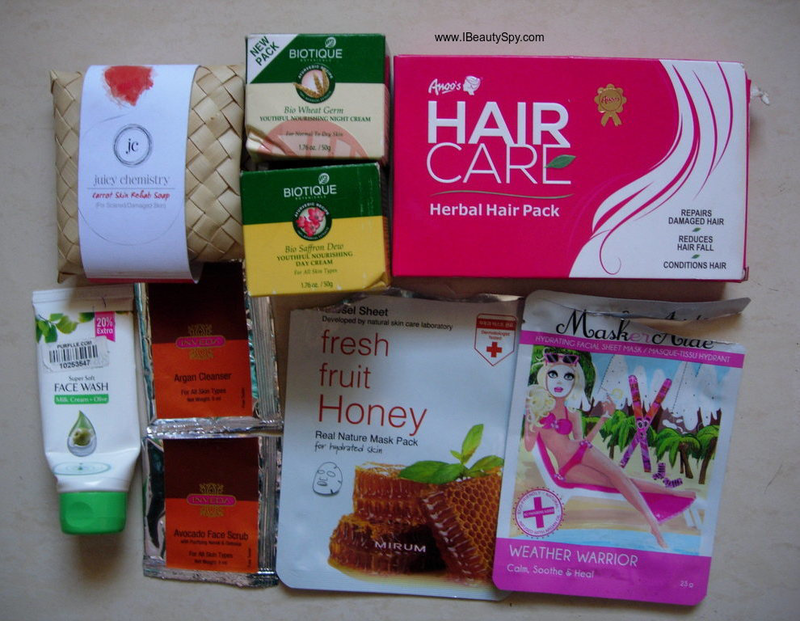 Anoo’s Hair Care Herbal Hair Pack: I got this in Anoo’s parlour that I visit. And I must say its very effective for hairfall. It also makes my hair voluminous and bouncy. If you have an Anoo’s parlour nearby, you should definitely try this out. Banjara’s Super Soft Face Wash Milk Cream + Olive: I have dry skin and this face wash made from milk cream and olive was apt for me. Though it has a very artificial fragrance. Mirum Fresh Fruit Honey Sheet Mask: I loved this mask. It has a sweet scent and gives an instant glow and nourishment to face. Maskeraide Weather Warrior Sheet Mask: This is a paraben-free, silicone-free sheet mask. It works great. Will do a detailed review on this soon. The Nature’s Co Mixed Berry Body Butter: This has a lovely fruity scent and makes me want to eat icecreams 😋 Its very moisturizing and heals dry patches as well. The Nature’s Co Lily of the Valley Body Lotion: A regular body lotion. Nothing great. Ma Earth Botanicals Rose Water Toner: I liked the effects of this rose water. It cleanses and tones my skin well. But the fragrance is little artificial. Ayorma Fairness Daily Scrub: Didn’t like it much. The scrub granules were very tiny. Vert Fresh Orange & Honey Shampoo: It made my hair very dry and frizzy. Didn’t like it. Inveda Argan Cleanser: This is a gel based, moisturizing cleanser with small beads. Works well for dry skin. Nothing great. Inveda Avocado Face Scrub: Its a cream based scrub with good sized particles. Nothing great again. 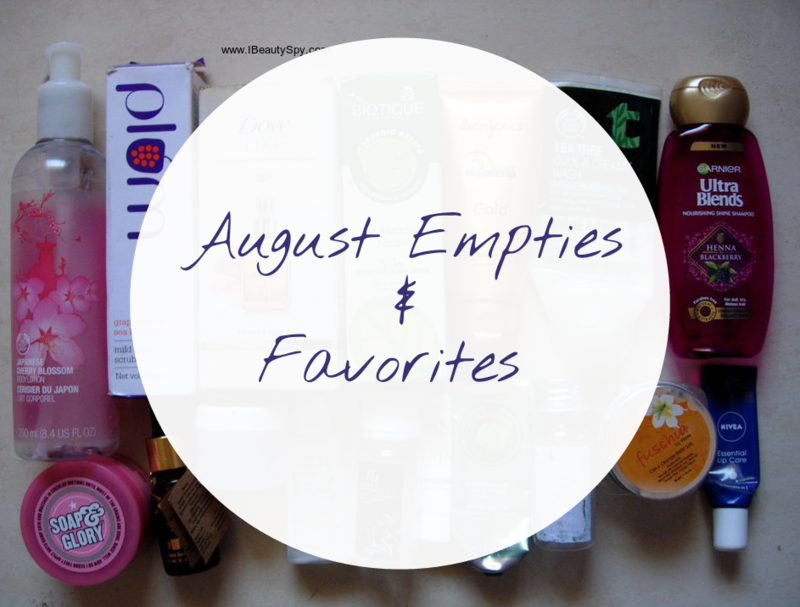 So that was my August empties and favorites. Do share your favorites of the month too. Yes, its really good. Gives the result of a facial at home. My my.. that is a lot of empty bottles.